Sure, you can keep your phone with the same wallpaper, icons, home screens and settings that it had when you first bought it - but where's the fun in that? A plethora of apps are available to enable you to get under the hood of your device and start making tweaks, and here we've collected ten of our favourites, from modding the notification lights and automating tasks, to revamping your home screen and managing files. Our round-up of tools is slightly weighted towards Android because it's a more 'hackable' platform and there are more tools available for changing different parts of the OS. If you're happy rooting your Android phone or jailbreaking your iPhone, then there are plenty of other apps and hacks you can consider, but we've restricted ourselves to tweaks and customisations that are possible without voiding your warranty. As ever, share your own recommendations in the comments. Tasker lets you set up specific conditions (such as a time of day or a particular GPS location) and associate them with a related action (turning off Wi-Fi or muting your phone's sounds, for example). The app recently received an interface overhaul to bring it into line with the look of Android 4.0+, and you can also use it to create customised menus and pop-ups. It's not the easiest app to get to grips with, but it enables you to automate a whole host of functions on your Android device. Unless you're going to jailbreak your iPhone, you're somewhat limited in terms of the tweaks you can make to the interface and iOS settings. Launch Center Pro is one of the apps that can make a real difference, enabling you to create 'quick links' (like desktop shortcuts) to other actions within apps. You can create a link to a specific options within any supported app: this could be a text message to a specific friend, the 'take a photo' screen in Instagram, or a particular Twitter profile in Tweetbot, for example. Android tries to do its best when managing your multi-tasking apps, but if you want to take charge yourself then enlist the help of Advanced Task Killer. If you're running Android 4.0+ Ice Cream Sandwich on your phone, then you can take advantage of Nova Launcher, a tool that's able to customise almost every pixel of the mobile OS's interface. Change colours, icons, dock behaviour, widgets and more as you like. Upgrade to the £2.60 Prime version to get extra goodies such as unread counts and gesture control. It's one of the most comprehensive launcher tools on the market for Android, and you can back up and restore your customisations at any time should you need to. Combine wallpapers, app shelves, icon templates and lock screens to create a look for your iPhone that is truly unique. 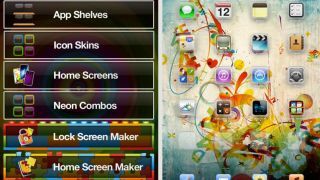 Pimp Your Screen has an impressive number of templates to pick from, and you can combine resources from within the app with your own artwork to tailor your iOS device's home screens to suit. There's a built-in preview feature so you can see the results of your customisations without exiting the app, and you can use the same settings across all of your iDevices if you wish to. Available as both a free and paid-for app for Android, Light Flow lets you take control over your notifications and specifically the notification lights on your device. Install the free Lite version first, to check compatibility with your phone - Light Flow requires root access on some models but not others.